Our barn is located 10 minutes west of downtown Salt Lake City. In order to keep our horses safe and to maintain a peaceful environment, we do not adverstise our address. We do welcome visitors by appointment, so please contact us if you would like to arrange a visit. What if I see a horse in need? Do you offer horse back riding? Noble Horse Sanctuary is not a riding facility. 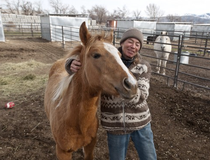 The horses that come to Noble often times have permanent injuries or are not stable enough to ride. Instead, we focus our efforts on rehabilitation, grooming, and exercising the horses by handwalking. "Let the giving begin. From 12:01 AM to 11:59 PM on Friday, you’re invited to log on to www.loveutgiveut.org, search through hundreds of charitable causes and — hopefully — open your wallet." Continue reading. March 18, 2013 - "Last year, the Park City Foundation raised five hundred ninety five thousand six hundred forty two dollars back on November 16th in their second annual day of giving to nonprofits in Summit County. Because of Park City's success now Utah is doing a day of giving - this Friday Love Utah Give Utah is your opportunity to give to the nonprofit, university or school of your choice. Love Utah Give Utah is the opportunity for Utahans to give what you can to our nonprofits." 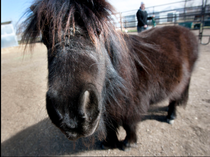 August 10, 2012 - Noble Horse Sanctuary and Catherine Kirby were featured on KSL as the most recent recipients of the KSL High Five Award. The High Five Award "celebrates people all over Utah that are doing the right thing." Thank you KSL and Les Schwab!